PHOENIX – The three-time WNBA Champion Phoenix Mercury today re-signed six-time WNBA All-Defensive team selection Briann January to a multi-year contract, as announced by the team. January was originally acquired by the Mercury from the Indiana Fever prior to the start of the 2018 season. 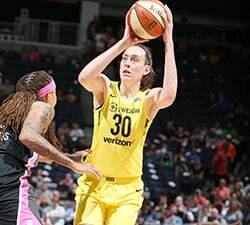 Originally the sixth overall selection in the 2009 WNBA Draft by the Fever, the 5-8, 144-pound January is a WNBA Champion (2012), a six-time WNBA All-Defensive team member (2012-17), a former All-Star (2014) and has reached the WNBA Finals three times in her ten-year career (2009, 2012, 2015). 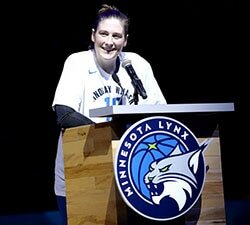 January’s teams have qualified for the playoffs eight times in her ten seasons, including six appearances in the Conference Finals (now the Semifinals) and the three Finals trips. The 5-foot-8 guard owns career regular season averages of 8.7 points, 3.6 assists and 1.1 steals, yet has boosted her averages to 10.2 points, 3.9 assists and 1.0 steals in 51 career playoff games. 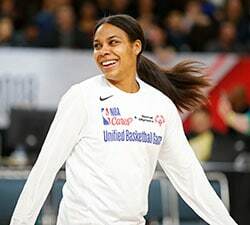 January has built her reputation as a hard-nosed defender and is the only WNBA player who was named to either the league’s All-Defensive First or Second team in every season from 2012-17. January has continued to excel as an excellent three-point shooter throughout her career, leading the league in three-point percentage in both 2015 (43.1 percent) and 2018 (career-best 47.0 percent), becoming just the fourth player in WNBA history to lead the league in three-point shooting in more than one season. In her first season with the Mercury, January started in all 33 games in which she appeared, averaging 7.0 points, 2.1 rebounds and 3.3 assists per game. While leading the league in three-point percentage, the former Arizona State standout shot 42.3 percent from the field, the second best mark in her career (42.6 percent in 2015). January helped set the tone for a Mercury defense that ranked second in the league in opponent field goal percentage (43.1 percent) last season, while typically drawing the responsibility of guarding the opposing team’s top scorer. While helping the Mercury to its sixth 20-win season in franchise history in 2018, January became the 26th player in WNBA history to reach 1,000 career assists, and moved into sixth place on the WNBA’s all-time postseason assists chart with 199. January has spent the past two seasons as an assistant coach at her alma mater, Arizona State University, on Charli Turner-Thorne’s coaching staff.